You can search for any company in your area and see a five-star rating for three key categories, benefits, health and safety, and respect along with average wages. Look through reviews from people with jobs and preferences that fit your own to see what life would be like in that company. With this information you can make well-informed decisions about where you want to work. Write a review and provide a ranking for companies that you've worked for in the past. By writing reviews you'll give other workers the information they need to make well-informed decisions and you'll get complete access to all of the premium features on the site. All reviews will be completely anonymous, we won't even collect identifiable information so that you know you'll be safe telling the truth. Companies will also be able to post job openings to all of our users, so you can search for the job that fits your exact needs. We will provide you with a job description, wage information, application process, and address for you to find the perfect job for you. 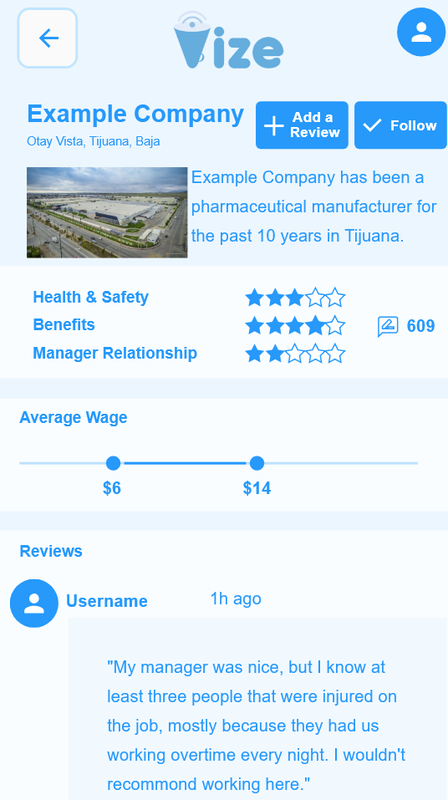 Professionals from local, national, and international organizations as well as our own users will post usable information that will help workers improve their own lives. Other educational material such as online courses, interviewing tips, and more will be available in later additions.